As the date for the New Balance 3rd Annual Girls on the Run 5K in Dane County approaches, set to run in Waunakee, WI on Saturday Nov. 12, Focal Flame Photography turns our thoughts to another youth athletic event earlier this season: the IronKids triathlon, presented in Madison for the first time in 2011. After profiling young athletes at the race on behalf of the Greater Madison Visitors and Convention Bureau and the Madison Area Sports Commission, Focal Flame Photographer Clint Thayer remarked, "There's just nothing like the energy of young, fired-up kids giving it their all on the race course. It's so much fun seeing them have a blast." Saturday, Sept. 10 – Middleton, WI - On the eve of the 2011 Ford IronMan Wisconsin for adult triathletes, 318 youth ages 6 to 15 years participated in the first-ever IronKids Madison race. Triathletes participated in one of three age divisions, with distances ranging from 50 yd swim/2 mi bike/500 yd run for the Juniors up to a 300 yd swim/8 mi bike/2 mi run for the Seniors. “The majority of IronKids athletes are first-timers,” said Christine Hanlon, Athlete Services and Marketing Coordinator for IronKids at World Triathlon Corporation. The chutes and transition area were lined with parents and fans, many carrying homemade signs to encourage their athletes. The bike racks in the transition area carried a high proportion of mountain bikes. Smiles were abundant on both novice and experienced youth triathletes. Many traveled to Madison from Green Bay, Milwaukee, the Twin Cities, areas in Illinois, and even beyond. Although the IronKids race series has been run since 1985, the World Triathlon Corporation assumed ownership of the series from former owner Sara Lee Corp., and is now offering 24 IronKids races nationwide. “Many of the athletes participating in IronKids today have parents who are participating in the IronMan tomorrow,” said Hanlon. Although Lorenz attends a small school, a triathlon club in her town helps youth train for events like the IronKids. The boy’s winner of the Senior division, Maxx Hall, is one of Lorenz’s teammates. One consideration for high school triathletes who also compete on fall team sports is that they are ineligible for races such as IronKids Madison if they occur during the academic year. Bannink said, “Once the fall high school season sports start, athletes are restricted by the high school Athletic Association rules. So they actually can’t participate today if they are on a sport that involves the same thing,” preventing high school swimmers or cross country runners from competing in September triathlons. But as a group of football players practiced on a field across from the start/finish area, the juxtaposition of classical team sports and endurance sports that are increasingly popular was notable. 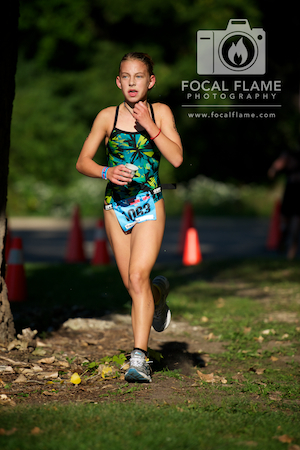 Focal Flame Photography is honored to share the stories of youth athletes at IronKids Madison and other events througout the Midwest. We've included several of our favorite images from the race. Look for upcoming event photography for the 3rd Annual New Balance Girls on the Run 5K and visit focalflamestore.com to purchase prints, digitals, T-shirts and more!